I have a feeling that the madness around the Valentine's Day is every year bigger and bigger. As a kid, I remember seeing this holiday as a pure American craziness, yet at the moment I cannot imagine the 14th of February without any heart-shaped balloons, dozens of roses and boxes of chocolate! Somehow the holiday became natural to us and no matter if you celebrate it or not, you cannot definitely skip this holiday. Today I would like to give your some last-minute gift and date ideas for the Valentine's Day, which I think could be nice for you and your beloved one! Pamatuji si, že když jsem byla malá, tak jsme měli prvního máje, a tím všechna "oslava" lásky skončila. Mám pocit, že každoročně je šílenství ohledně Valentýna větší a větší, a 14. února bych si bez květiny růží, balónků ve tvaru srdíčka a bonboniery ani nedokázala představit. Ať už Valentýna slavíte nebo ne, je jisté, že se nemůžete vyhnout - ať už chcete, nebo nechcete. Pokud patříte mezi Ty, kteří Valentýna slaví, tak právě pro Vás mám pár last minute tipů na to, jak ho s Vaší lepší polovičkou strávit nebo čím je obdarovat! Is there any other occasion that deserves more celebration than love? If you wanna do something for Valentine's Day without being too cheesy, having a fancy dinner with your beloved one is the perfect choice. Eat at your favourite restaurant, order your favourite meal, have a glass of wine and simply enjoy the atmosphere of your beloved one. 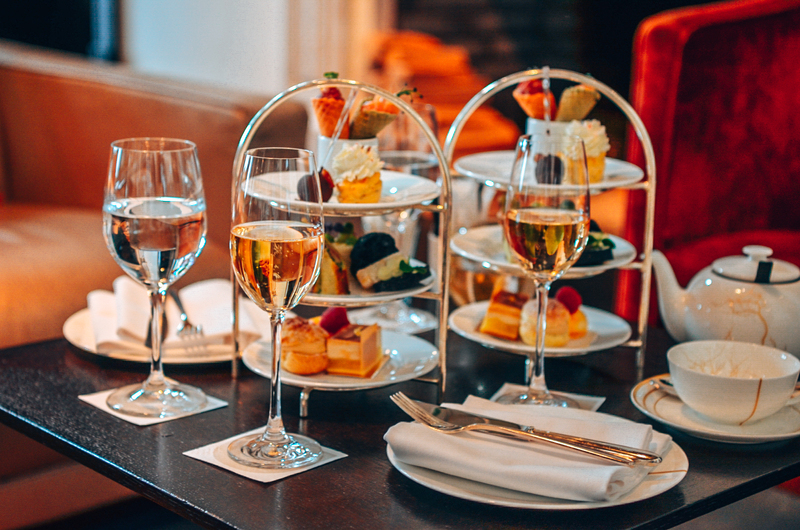 As you know, we will celebrate this holiday in Zurich and I can only recommend to try the Saltz restaurant at the The Dolder Grand or perhaps enjoy an Afternoon Tea in their Lobby. The Saltz restaurant was really outstanding to me since they had a great atmosphere in the room. It's definitely something special and different. The restaurant offers both from national and international cuisine, and the fact, that it was rewarded with 2 Michelin-stars speaks itself! Co si víc zaslouží oslavu než pravá láska? Pokud to na Valentýna "nechcete přehánět", ale zároveň chcete tomu druhému ukázat, že na něj myslíte, pozvěte jej na valentýnskou večeři - zajděte do svojí oblíbené restaurace, objednejte si svoje oblíbené jídlo, dejte si sklenku vína a prostě si užijte toho, že jste spolu. My budeme Svatého Valentýna trávit v hotelu The Dolder Grand a rozhodně zajdeme do jejich restaurace Saltz, která má skvělou atmosféru. Zároveň je také ohodnocená 2 Michelinskými hvězdami a nabízí to nejlepší z místní i mezinárodní kuchyně! 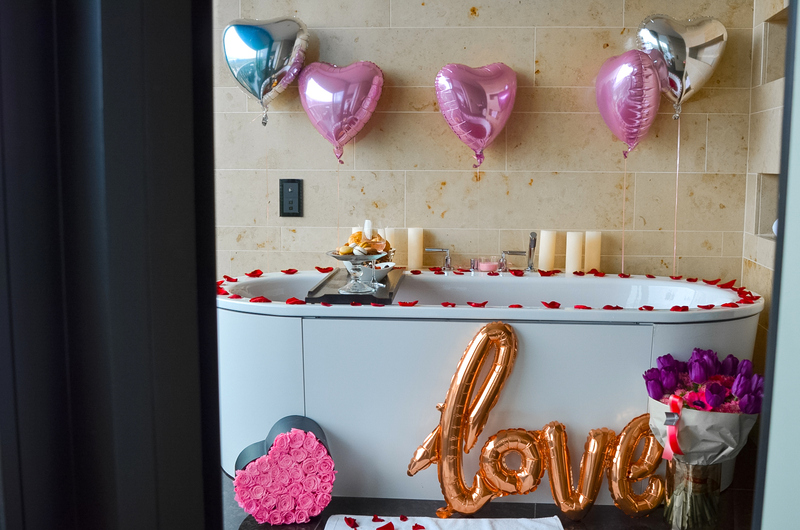 What other occasion deserves a special celebration than love? If there is a day you can treat yourself and your partner, it's the Valentine's Day. Make a booking at your favourite restaurant, eat your favorite food, drink a glass of wine and enjoy spending time with your love. As we are staying in Zurich right now, my recommendations is the restaurant Saltz at the The Dolder Grand. 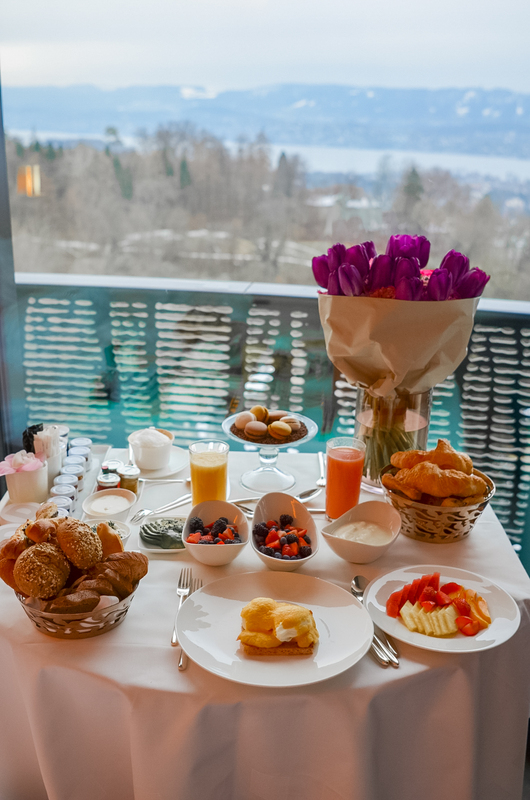 This 2-Michelin star awarded restaurant is overlooking the Zurich lake and offers the best of the best from international cuisine, featuring dishes from meat, fish and also vegetarian options. 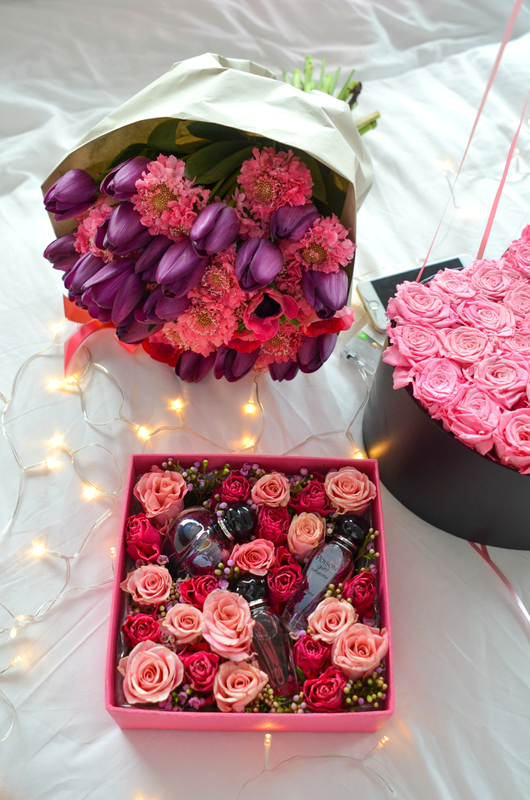 How to say I love you more than with a bouquet of flowers or a small gift? There are many options of what you can get your beloved one: from jewelry over a box of chocolate to a perfume. 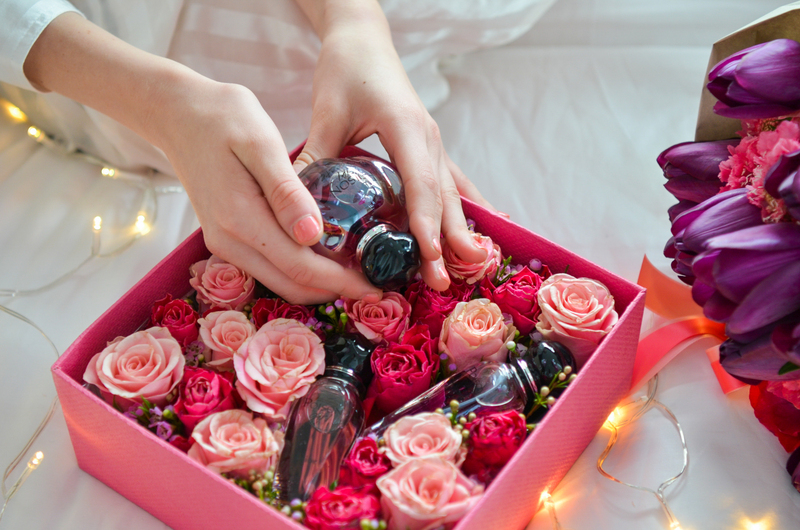 I like to keep the gifts in the name of love and that's why one gift that was really outstanding to me was this beautiful box filled with roses and my favourite Dior Poison Girl perfume. 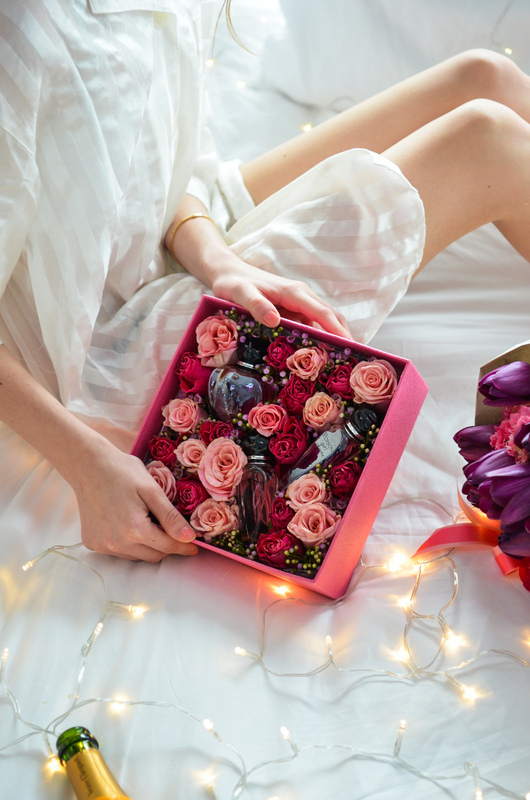 This creation was made by the amazing flower store Belles Fleurs and I think nothing is more romantic than a combination of something I love - like the Dior Poison Girl - and a bouquet of roses in one box! Byl by to vůbec Svatý Valentýn bez krásné kytice? Myslím, že pokud chete být "safe", tak byste měli sáhnout po krásné kytici, která rozhodně potěší kohokoliv. Pokud ale přecejenom toužíte po něčem originálnějším, určitě kteréhokoliv z nás potěší box, který jsem dostala já - a to překrásnou krabičku růží od Belles Fleurs v kombinaci s mým nejoblíbenějším parfémem Dior Poison Girl. Jedná se o něco nečekaného, ale zároveň klasického! What is more valuable than spending time together? 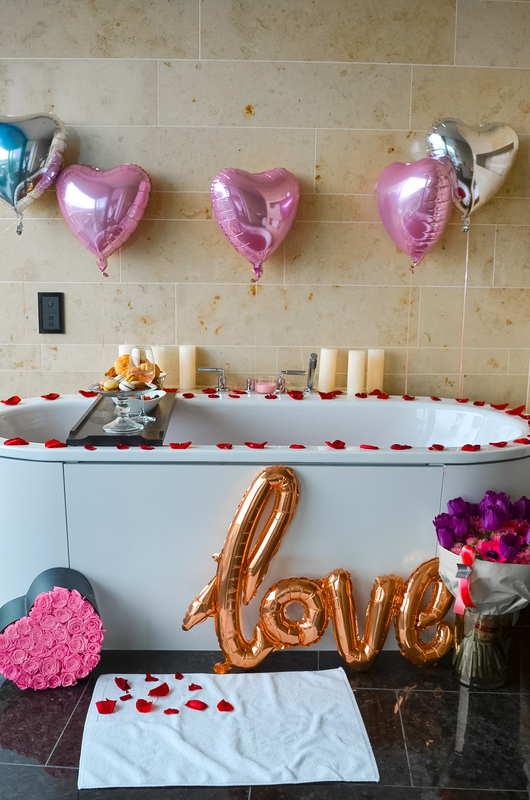 There is nothing more romantic than taking some day off and enjoy together a great day at the spa - no matter if it's at home or if you decide to book a stay in a hotel, you will both have time to relax and enjoy each other. If you are looking for an outstanding experience, I can only recommend the 4 000-sqm large spa at the The Dolder Grand, a luxurious 5-star hotel in Zurich. The spa offers several beauty and health treatments, including manicure, pedicure, masks, massages and many, many more. For me, my personal highlight was their outside pool overlooking the whole city of Zurich! If you are on a budget and don't want to book a stay at the hotel, don't worry - you simply book one day at the spa and enjoy a full day there from 6am till 10pm! Nevím, jak Vy, ale my na sebe s přítelem moc času nemáme, a tak si zážíme každé minuty, kterou spolu můžeme strávit. Vždycky si vážíme času, který spolu strávíme a vždycky spolu rádi cestujeme. Proto si myslím, že není od věci si zabookvat den nebo třeba i víkend ve spa. 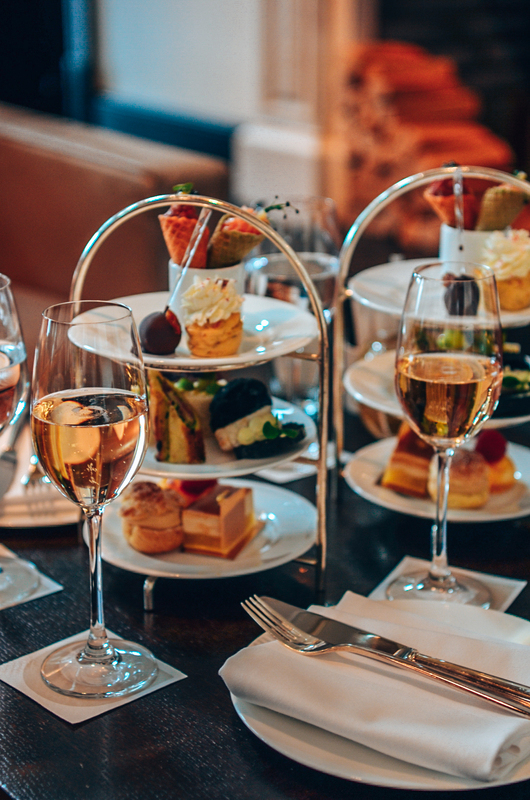 Já bych Vám dooručila spa v hotelu The Dolder Grand, které se rozkládá na ploše 4 tisíc metrů čtvrečních. Kromě klasických masáží si ve spa můžete užít relaxačních masáží, kosmetických procedůr, sauny, páry, relaxačních místností, vnitřního a především venkovního bazénu, ze kterého máte neuvěřitelný výhled na celé město! 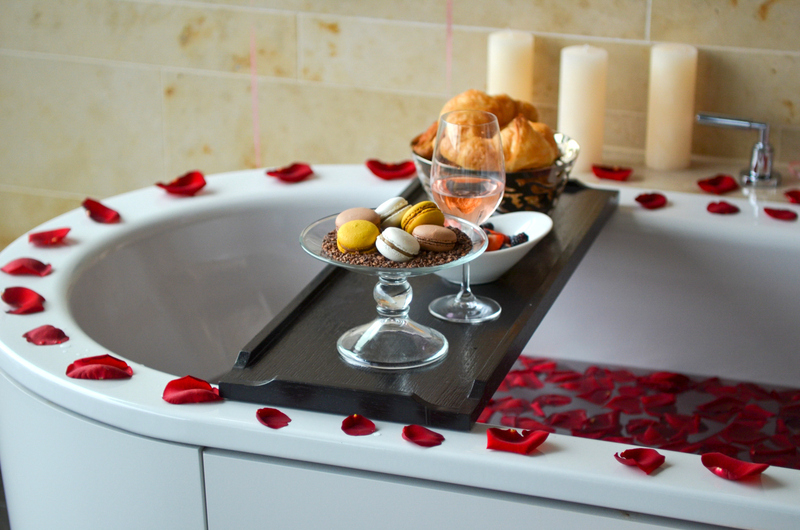 If you wanna go all-in, why not to book a romantic getaway for yourself and your beloved one? When it comes to Valentine's Day, remember there are no limits! We decided to spend our Valentine's Day at the amazing hotel The Dolder Grand, as I already mentioned before. This luxurious hotel is definitely something different and something with A LOT to offer - of course you can chill and relax in your room with the most gorgeous view of the whole city, wake up late and enjoy in-room breakfast at the balcony. Besides this, the hotel has also other highlights which are worth the mention: besides their amazing spa, which I already mentioned, you can enjoy a meal at their 2-star Michellin Star restaurant the Salz, enjoy a helicopter ride, which is provided by the hotel, take a walk in the surrounding forest or even ice-skate at the biggest artificial ice rink in the whole Europe! The service at the hotel is truly amazing and trust me, the hotel staff will take care of any of your wishes! Pokud chcete jít "all-in", tak neváhejte a zerezervujte si romantický výlet jen pro Vás. My jsme se rozhodli Valentýna strávit v hotelu The Dolder Grand, který je akraktivní pro svou pestvou nabídku - kromě klasického lenošení na pokoji a pozdní snídaně na balkoně, si můžete vychutnat i již zmiňované spa, jednu z jejich vynikajících restaurací, ale také například výlet helikoptérou nebo bruslení na největší umělé ledové ploše v celé Evropě! To samozřejmě doprovázejí vynikající služby a příjemný personál! Wow, the photos are just perfect!!! <3 Amazing. Such a beautiful post dear! Happy valentine!